This is a continuation of a travel series to South Dakota. To start at the beginning, go HERE. The rest of the posts in chronological order are HERE, HERE, HERE, HERE, HERE, HERE, and HERE! At some point in every Americans life they need to visit Mt. Rushmore. I can't believe how much seeing this national memorial in real life moved me. I had to choke back tears multiple times. When driving to Mt. Rushmore, you actually see the memorial before you pay to get through the gate. I squealed with delight upon it's sight. I couldn't believe I was finally here, that I was finally seeing the mountain I had seen pictures of my entire life. I couldn't wait to get through the long line of cars and just park the car. I even got irritated at my husband cause he took too long finding the perfect parking spot. 😊 I just wanted to get out of the car, and get as close to this masterpiece as possible. Of course, we had to stop and take pictures of ourselves in front of the sign first! This is the entrance to the memorial. More than two million people from all over the world visit Mt. Rushmore annually. We were amazed at all the different languages spoken around us while we were there. And here is the Avenue of Flags with Mt. Rushmore seen in the distance. "The Avenue of Flags was initially established as part of the celebration of the United States' Bicentennial in 1976 at the request of a visitor. The 56 flags represent the 50 states, one district, three territories, and two commonwealths of the United States of America. 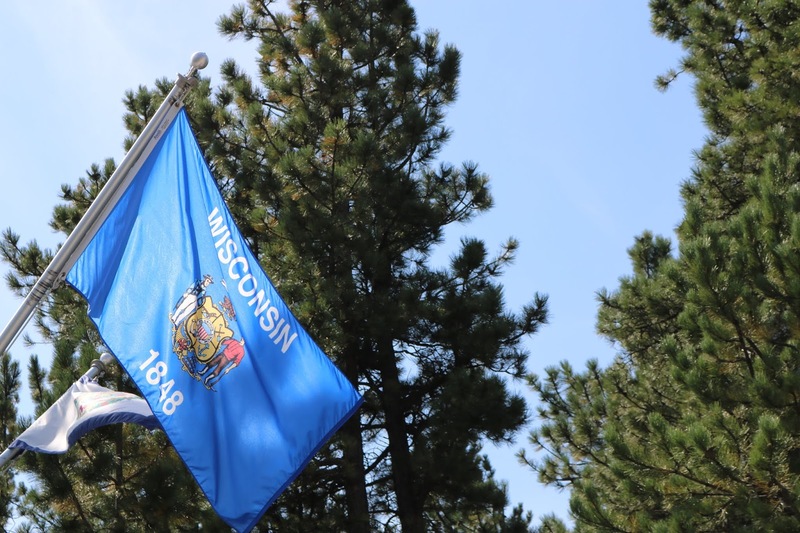 The placement of the flags are in alphabetical order with the A’s on the walkway near the concession building and the W’s near the Visitor Center and Museum. The names of each state, district, commonwealth or territory are listed on the pillars directly below each flag." We made sure to look for our state flag! 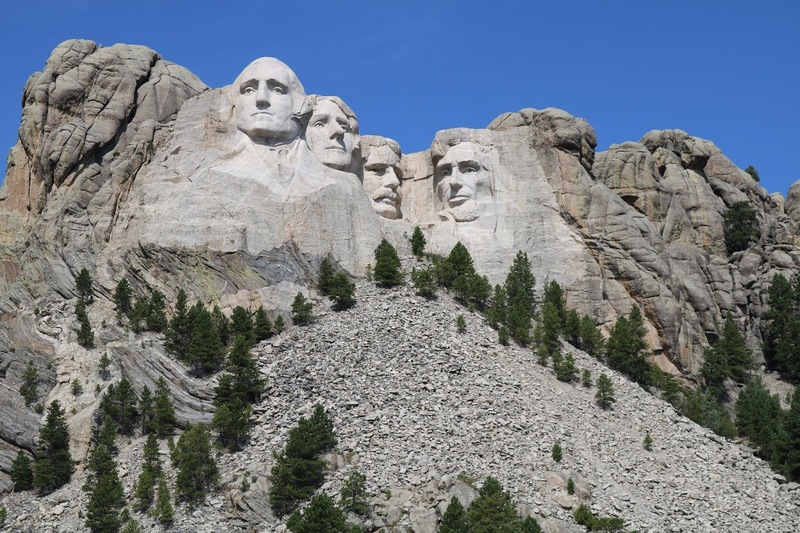 The heads of the four presidents (George Washington, Thomas Jefferson, Theodore Roosevelt, and Abraham Lincoln) are 60 feet high. Did you know originally the presidents were suppose to be depicted head to waist but lack of funding forced construction to end in 1941? 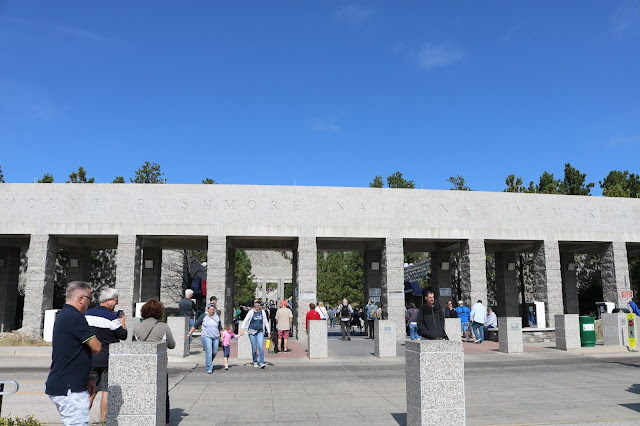 After the initial excitement of rushing into the memorial grounds and seeing the Avenue of Flags, when you walk closer to the memorial using the planked walkway, the ambiance changes. My husband and I noticed how quiet it got. He semi-joked "It's as if people know they are walking on hallowed ground". It was here where I really had to fight back the tears. The political turmoil of the past two or three years has really gotten to me. I worry so much about what is to become of our country. I worry about losing our roots, our traditions, our freedoms. I listened to people talk in hushed tones around me and I could hear conversations of worry. Many expressed concern that Mt. Rushmore is next on the chopping block of monuments to be destroyed because someone doesn't like the person being memorialized. I don't think that will happen. But then again, I never thought in my lifetime I would see some of the things I'm seeing today. These are scary times. Another interesting trivia fact: Did you know Mt. 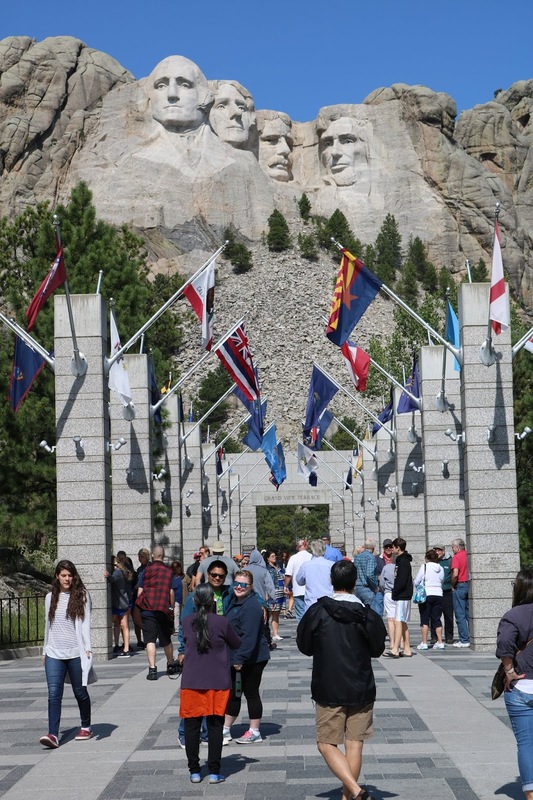 Rushmore was an idea conceived by historian Doane Robinson to promote tourism in the area? His initial idea was to sculpt Needles, which is located in Custer State Park and I will show those amazing formations in a later blog post. 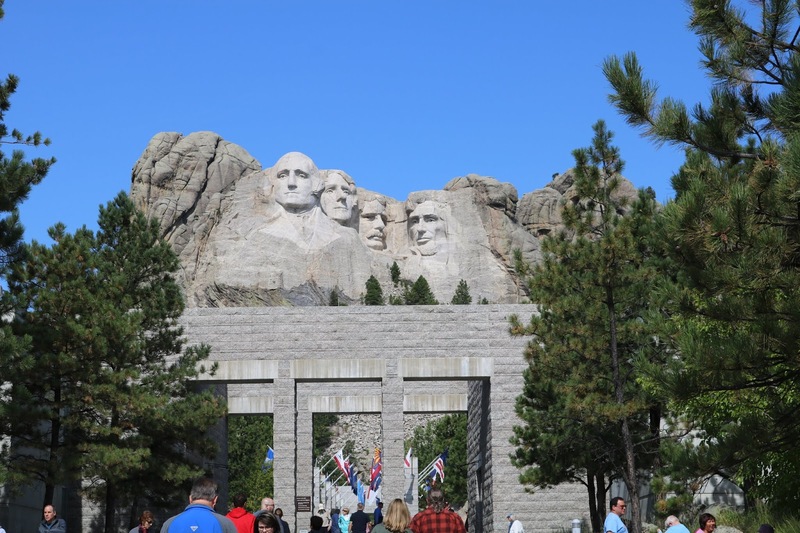 However, the sculptor, Gutzon Borglum, rejected that idea because he found the granite in Needles to be too poor of quality and he also faced opposition from Native American groups. 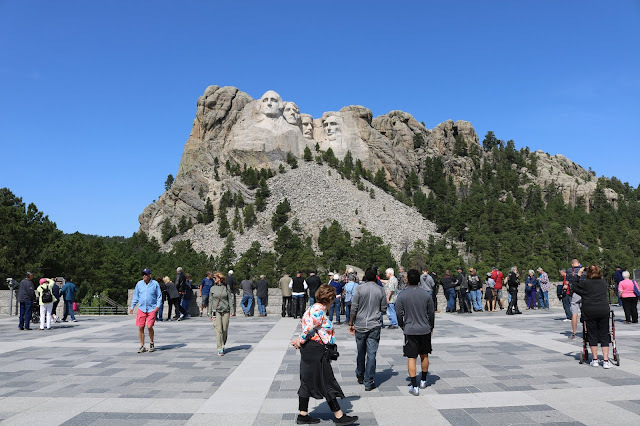 Robinson also wanted the sculpture to feature American West heroes like Lewis and Clark, Red Cloud, and Buffalo Bill Cody, but Borglum decided on the four presidents because he wanted the sculpture to have a wider appeal. I think he made the right choice! The memorial park covers 1,278.45 acres and is 5,725 feet above sea level. There are multiple walking paths you can take around the park to get different views. Unfortunately, one path was closed for maintenance when we were there. This is the main viewing area. There is also a seating area below the fence. Here is where people gather for special presentations or the night time show. The park is open daily from 5:00 a.m. to 9:00 p.m. The sculpture is illuminated every night, and there is an Evening Lighting Ceremony at dusk during the main tourist season. 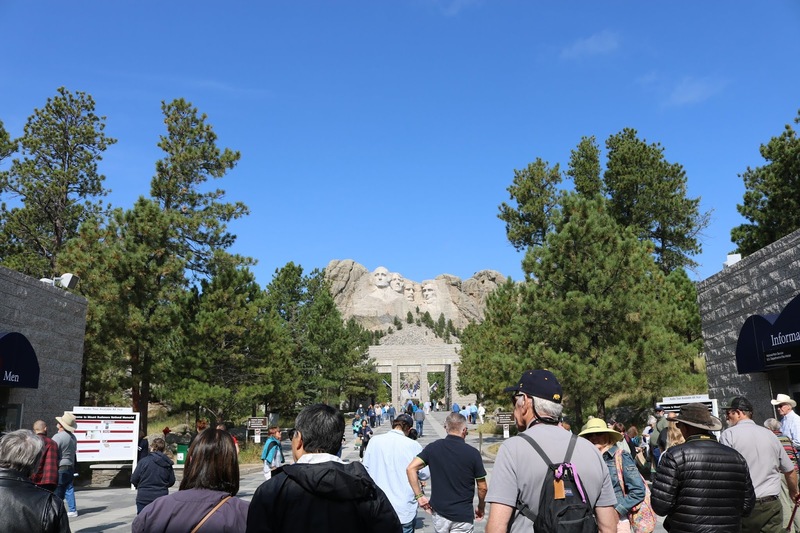 There is no fee to enter the park, but there is a $10.00 parking fee which is good for one full year! Ours s still in the glove compartment of our car in case we have the opportunity to go back! I'd love to see it lit up at night! I can not wait to see this in person! My boys and I have been reading a few books about it and we did know that they had to search around for the right place/ materials to carve it and that they were originally supposed to be shown all the way to the waist. They came pretty close to scrapping the project a few times when they ran way over time and over budget and when the main designer died. You and your boys will have an amazing experience. Especially if they read up on it. I am so glad they did not scrap this project! It truly is a must see monument and attraction, wish I could go back for another visit! We also got some amazing views from a distance from a random view point along the way. 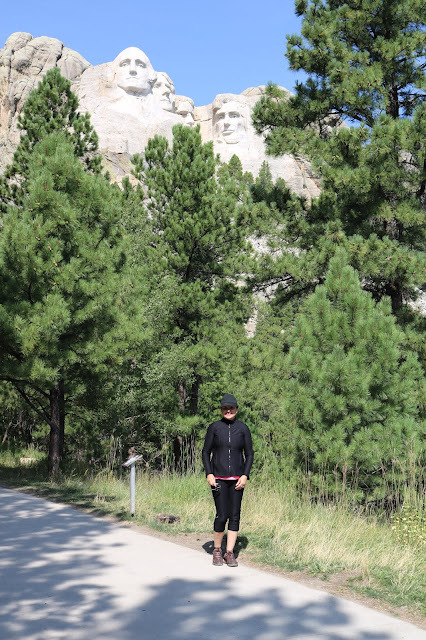 We so enjoyed visiting the state of South Dakota! Absolutely! Yes, I hope to go back too and see it at night. There are so amazing views from Custer State Park too! It is a fascinating place. If you ever get back to the states, you really must visit it! I was there as a kid, but I'm sure I didn't appreciate it like I would now. Heck, my husband has never been there. I may have to put this on the books for next year!! Even though it's a great place to take kids to learn more about our history, I can see not really appreciating it until your older. I'm glad I went when I did. I don't think I would have appreciated it had I seen it when I was younger. It fascinates me how creative some people are and that they can carve something like this (or even the marble sculptures of the Italian masters) It was interesting to see it from the ground with the entry arches - I didn't know they were there. Thanks Leanne, yes, it's so fascinating. Wow! What a huge undertaking this must have been. Thanks Christie! I hope you get there! It took me 56 years to make it there and I only live about 10 hours away from it! Can you believe I have never been. How neat that was such a moving experience for you. Oh, I believe it! Look how many years it took me to get there. Hopefully you'll see it someday too. This would be so cool to see in person! We have nothing like this here in Australia! Sounds like it was a great day out. It was really cool Mica. But I'm sure there's lots of cool things to see in Australia too. 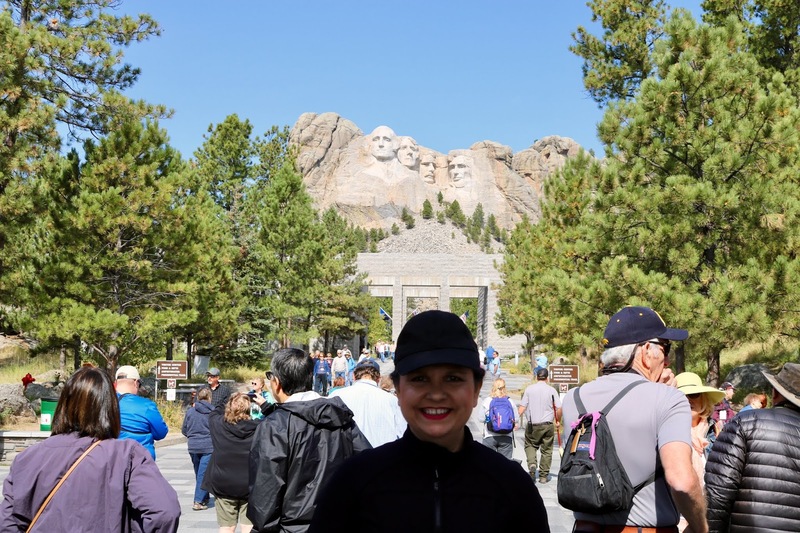 My husband and I have wanted to visit Mt Rushmore for years. Not sure we will make it but your post gave me a good look. It's a wonderful place for husbands and wives to visit. Something of interest for everyone. Such an amazing place indeed. Yes, it was! Thanks for visiting Jess! Thank you for joining the "Travel Tuesday" meme.